It’s been a while since I posted a missive on our venture investments and I felt it was long overdue given the fundamental changes we’ve made to our strategy. We are now investors in a mind-boggling 182 startups! We had 56 exits, 26 successful and 30 unsuccessful with an average exit multiple of 5.5x. We’ve also been on fire of late with the IPO of Alibaba Group and Lending Club, the exits of Brightroll and Sunrise and several of our seed investments passing the billion dollar valuation mark like Delivery Hero and FanDuel. As always, Jose and I remain very transparent. We put our entire Portfolio online. You you can see all of our investments and sort them by geography, stage, investment year etc. 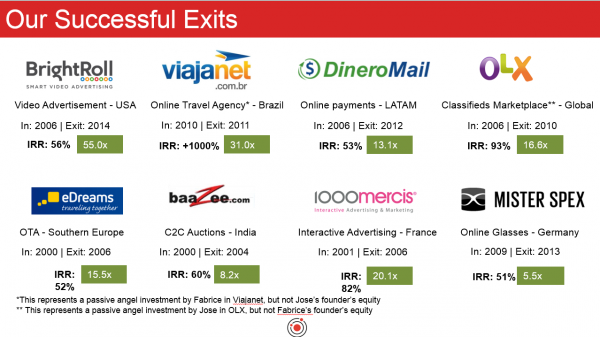 In the spirit of transparency we show which exits are successful and unsuccessful. We summarized our Investment Strategy for entrepreneurs to peruse before reaching out to us. We built a form where entrepreneurs can submit their startup for investment consideration. Seed stage valuations are very frothy, but we are not (yet?) in a bubble. Companies are staying private longer than ever before. The US economy is doing very well. Turkey, Russia and Brazil have made bad political and economic decisions. The US startup ecosystem is more robust than ever. Many industries and businesses can be re-invented using capital efficient marketplace models. We now typically invest larger checks ($150-200k) at a slightly later stage when companies typically have $100-$500k in gross sales. We have become stage agnostic, investing at every stage from seed all the way to pre-IPO. We invest in San Francisco and Silicon Valley more than ever before. We focus on the US, and are opportunistic in other countries. 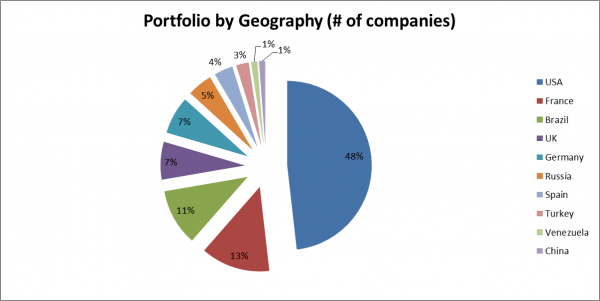 We are more helpful to our portfolio companies than ever before. We syndicate many deals on Angellist and Funders Club where we also manage multi-company funds. We mainly invest in consumer-facing transactional marketplaces, but are open to other models. Incubators are also proliferating and investing more than ever before: Techstars, 500 Startups and many others have appeared on the scene and Y Combinator classes are bigger than ever. The spring 2015 Y Combinator class has well over 100 startups! Even the emergence of Kickstarter and other crowdfunding startups is tilting the tables in favor of entrepreneurs. 2006-2010: Priced rounds at $3-5 million pre-money for startups that are live, with clear unit economics and a modicum of traction (say $25k per month in revenues). For instance I invested in Brightroll in 2006 at a $4 million valuation. 2011: Notes with a 20% discount on the series A and a $4-6 million cap for startups that are live with a bit of traction. 2012-2013: Notes with a 20% discount on the series A and a $4-12 million cap, though a number of startups are raising on notes without discounts to the series A or on uncapped notes often on Powerpoints or with no traction and no pre-defined business model. 2014-2015: Notes with a 20% discount to the series A and a $8-12 million cap with a cool product, but no traction and often no pre-defined business model. I am glad that uncapped notes that peaked in 2013 seem to be mostly on their way out. They were the reason we only made 20 investments in 2013 vs. 41 in 2014. However, valuations of seed stage startups with limited traction out of Y Combinator have dramatically increased to $8-12 million. It is surreal to observe investors with not tech experience commit millions in startups after a 2 minute pitch at Y Combinator demo days. The YC demo day non-withstanding, we are not in a bubble yet. Having lived through the bubble, I remember clearly companies with no revenues going public and being worth billions, if not tens of billions of dollars. Today’s top companies like Uber and Airbnb may appear expensive, but they have billions in revenues, are growing extremely rapidly (they are some of the fastest growing companies in history from a revenue perspective) and have real business models. As global interest rates are at record lows, people are yield chasing. 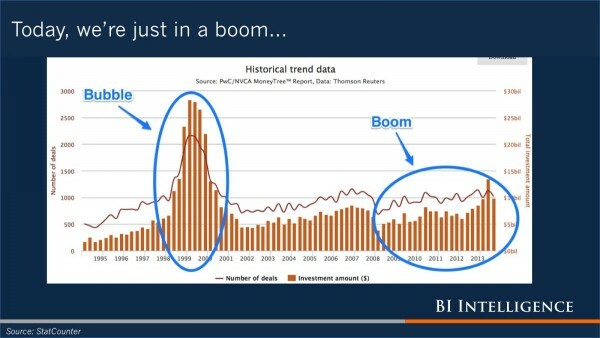 As the tech sector is one of the engines of growth and wealth creation it’s experiencing what Henry Blodget defines as a boom. Despite the seed frothiness, there are still opportunities, especially at a slightly later stage. While there has been seed stage inflation, it only appears ridiculous for YC companies. The valuation of seed stage companies out of Techstars, 500 Startups or entrepreneur-led are more reasonable, albeit significantly higher than 5-10 years ago. This is by no means a criticism of YC. They select amazing entrepreneurs who build amazing companies many of which we end up backing either out of YC or at later stages – especially if they are in categories where we feel we can bring a lot of value. At the same time venture firms are moving to later stages. Many of the firms that used to raise $100-400 million funds to write $4-8 million series A checks have now raised $500+ million funds and sometimes $1+ billion funds. They are realizing that they need to invest larger checks, pushing them naturally to later stages. This is creating lots of competition for later stage deals and allowing breakout seed companies to bypass the traditional Series A completely and raise large rounds at what used to be Series B valuations. However, many companies that do well, but not extraordinarily well have a hard time raising Series A money given that you have many more seed fund startups chasing fewer Series A dollars. Large seed extensions have now become common as well as Series A rounds led by lesser known firms. Rather than investing in a team and product with no traction in a note with a $10-12 million cap, we now often wait 6-12 months for the company to be doing $150 – $500k / month in gross sales and join the seed extension or series A which ends up being priced at $12-20 million – a small premium we are more than happy to pay given that the business is now more proven. We will also pay up for breakout companies. We remain unit economic driven and price sensitive, but will bend that price sensitivity rule if the company is growing by leaps and bounds and we can reasonably expect it to grow into its valuation – especially with the capital that it is raising. Entrepreneurs would do well to remember that 99% of startups sell for less than $30 million, many for less than $10 million. Entrepreneurs think that raising money at a high valuation or with a high cap is a badge of honor, but raising money at a high valuation also prices you out of exits and makes it harder to raise follow-on capital. Companies used to go public once they were worth a few hundred million dollars. I anything Apple’s market capitalization of $1.78 billion at IPO in 1980 was the exception. These days the very best companies stay private much longer. Facebook went public at a $100 billion valuation in 2012, 8 years after it was created. Alibaba Group went public in 2014 at a $225 billion valuation, 15 years after its creation. According to the NVCA, the average time for a venture-backed company to IPO has gone from 3.1 years in 2000 to 7.4 years in 2013. The very best companies like Uber and Airbnb are raising money at tens of billions of dollars in valuation to stay private longer. If anything the companies that are going public at $1 billion valuations like Box seem to be the ones that have no financing alternatives. As a result there are more private companies worth $1 billion or more than ever before as can be seen in the graph by CB Insights below. This makes eminent sense. The explicit and implicit costs of going public have increased dramatically. As an Internet entrepreneur I used to dream of taking my company public. No longer! The process for going public is painful and extremely distracting. Analyst coverage and liquidity for companies worth less than $2 billion is limited. You have to share more information about your strategy that your private competitors can take advantage of. The need to “hit the numbers” makes it hard to experiment with new business models or to cannibalize your own business even if it’s the logical business decision. There are more sources of capital to late stage companies than ever before. Traditional VCs have raised large funds forcing them to invest at later stages. Non-traditional actors like hedge funds and even mutual funds are also investing in late stage private companies. Investors are offering founders and employees partial liquidity either in financing rounds or through platforms like SharesPost and Equityzen. Historically the arrival of non-traditional actors has been the harbinger that we are near the peak of a bubble. However, this time may actually be different. Public market actors feel they must enter the private market because the value that used to accrue to public investors (e.g. ; Microsoft’s increase in value from $500 million to $336 billion) is now accruing to private investors. Public investors in Facebook only saw a 2.2x return from $100 billion to $220 billion. Private investors at every stage got the vast majority of the upside. Unless there are major changes in the rules for going public, this trend seems here to stay. Partly in response to companies staying private longer than ever before, we have become stage agnostic. The link may not seem obvious at first so I will make it more explicit. As described in Why we play Moneyball rather than Powerball , we follow a number of heuristics when investing. Our price sensitive, unit economic driven approach has worked well for us and for the entrepreneurs we backed. It’s a very different strategy that every other VC follows. As Peter Thiel points out in his venture class, venture returns follow a power law distribution (read Blake Masters Class 7 notes) for more details, most of the venture returns are created by companies that end up being worth more than $10 billion. As a result being a top tier VC is all about getting in those companies and not worrying too much about what the entry valuation is or whether they already have unit economics. They don’t worry about minimizing losses from bad investments, it’s all about finding THE investment that will make the fund. In a way that was our story until 2013. We focused on great companies and entrepreneurs without expecting to invest in the super unicorns. However, as companies have stayed private longer, it gave us more opportunities to identify breakout companies and clear winners in specific categories. It also gave us more time to find ways to invest in them, either in late stage rounds or through secondary transactions. Following this aggressive later stage strategy we ended up investing in Alibaba Group, Airbnb, Uber, Lending Club, BlaBlaCar, Mindbody and countless others. We make $100-200k seed and Series A investments in early stage companies with $50-500k in revenues with proven unit economics at valuations we consider reasonable in light of the traction, market and team experience. We make larger later stage investments in breakout companies in their Series B (usually investing $250-500k) and large investments ($1 million+) in clear winners in certain categories (usually transactional marketplaces). 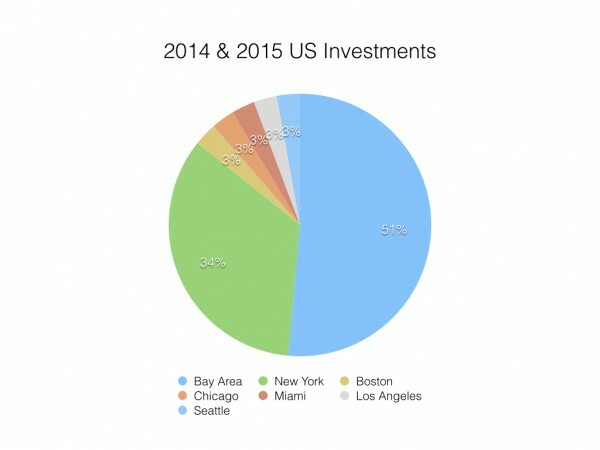 Those later stage investments have mostly been in Bay Area-companies, changing our overall US investment mix from 50% New York until 2012 to 51% the Bay Area in 2014 and 2015. These investments have also proved beneficial for our Bay Area early stage deal flow and we hope to now be in a position to invest in more unicorns. Between Beepi’s board meetings, our increasing late stage investments and Bay Area deal flow, I am now spending 2 weeks per quarter in San Francisco and Silicon Valley. Guimar, Jose and the rest of the team are also spending an increasing amount of time there to the point we are even considering getting a place in San Francisco. Global macroeconomic and political factors have also pushed us to focus more on the US that ever before. Beyond a rebalancing of our US investments from NY to San Francisco and Silicon Valley, we changed our global investment mix to focus much more in the US. Until 2012, only 48% of our investments were in the US. 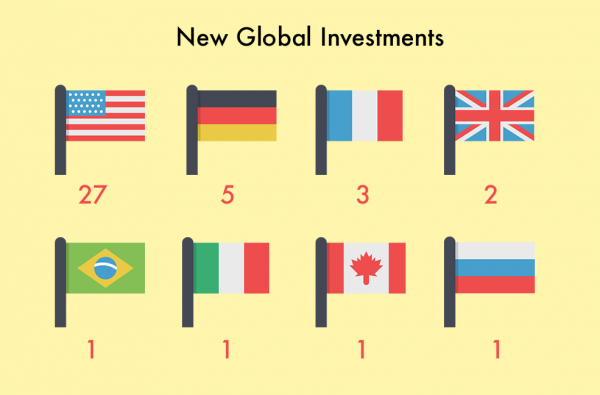 France, Brazil, the UK and Russia combined accounted for 36% of our investments. However in 2014, 70% of our investments were in the US. We were only reasonably active in Germany (15% of the investments) and merely opportunistic in other countries. Russia squandered its opportunity to reform its economy while oil prices were high, allowed oligarchs to plunder its economy and entered in a futile conflict over Ukraine, making it all but impossible to raise venture money from non-Russian investors there. Brazil was in a perfect position to establish itself as one of the growth engines of the world. Its Bolsa Familia increased general welfare, its natural resources were in high demand, especially from China, it found huge offshore oil reserves, and inflation had finally come under control allowing interest rates to be cut. Sadly, it too squandered its opportunity to reform while the going was good. Nationalism around natural resources and local production rules led to huge costs for Petrobas – which was also used as the country’s piggybank. The government kept rates too low too long, reigniting inflation. Brazil squandered its opportunity to tackle the “custo-Brazil” – an extraordinary tax on productivity because of byzantine regulations and taxes – not to mention prohibitive tariffs. While the long term prospects are still good, from a comparative advantage perspective Brazil is much less appealing than it was a 5 years ago. France spent most of the last 3 years sending counterproductive messages with its 75% tax rate, anti-Uber and Airbnb laws and blocking the sale of DailyMotion. Europe in general has been stagnating. Many countries have entered deflation and politicians and policy makers are generally making things worse by treating Greece’s fundamental solvency issue as a cash flow issue. Pushing banks to further lend to Greece will only worsen the inevitable default. Europe as a whole has not tackled its banks’ bad debt intelligently. They pursued the Japanese strategy of letting zombie banks earn their way to solvency, rather than separating the good banks from the bad banks and the good assets from the bad, as the US did more effectively. As a result Europe as a whole has not deleveraged much and has much worse growth prospects. In light of the benign inflationary environment and the fact we are entering a presidential election cycle, I suspect interest rates will remain lower than people expect, for longer than people expect. As such a lot of capital will be yield chasing which will lead to continued exuberance in the tech sector. This may eventually lead to a bubble and a day of reckoning, but I suspect it’s at least 100 basis points of interest rate increases away and 18 months away. In the meantime we’ll see great companies like Uber and Airbnb go public. The US already benefited from the strength of the fully fledged Silicon Valley Internet ecosystem. Capital is available for companies of every size and exits happen at every point in the life of a company. In most countries there are entrepreneurs and angels, but a real lack of Series A & B capital. American investors find you again once you cross $100 million in value, but getting the capital to get there is difficult. At the same time, exits are often limited to companies that become large enough that they attract American acquirers or can go public. By definition this only happens to a small subset of startups. Only Beijing and Berlin have reasonably robust ecosystems outside of the US. It’s also why we focused our investments in Germany and large markets like Brazil where the domestic markets are large enough that the companies can reach $100+ million in value. The Bay Area’s center of gravity has shifted from Silicon Valley to San Francisco. New York has emerged as the second largest ecosystem with a leadership position in fashion, ad tech, fin tech and the maker movement. Amazing startups are also coming out of LA and other cities. More people are pursuing the entrepreneurial path than ever before. There are more angels than ever before facilitated both by the thousands of newly minted millionaires from the various tech IPOs and Angel.co and FundersClub. There is more late stage capital available than ever before. Contrarily to what Mark Cuban recently announced, there are more exits than ever before with even failed companies getting acquihired because of the tightness of the labor market, especially for tech talent. This robustness is reinforcing our focus on the US. It’s why we are spending more time in the Bay Area. It’s also why we decided to be more helpful to our portfolio companies. We are proactively helping the very best startups fundraise by giving them feedback on their decks and introducing them to top tier VCs. At the same time, we are helping facilitating business development deals by making introductions to our 182 portfolio companies. This is also why we love syndicating deals on Angellist and FundersClub. Beyond allowing our friends to co-invest with us, it’s super useful for the startups. They raise money quickly and easily without needing to dedicate too much time to the process. They increase their public profile improving their PR. They get a devoted investors who can be partners, customers and promoters. Follow us on Angellist and FundersClub to view our upcoming deals! Possibly because I am an economist by formation, I love building and investing in marketplaces. I love bringing transparency and liquidity to previously fragmented and opaque markets. As luck would have it, the world has changed to allow marketplaces to emerge and disrupt ever more markets. As I wrote over the last few years, marketplaces have evolved from horizontal listing based models to vertical transactional models, which are now often service augmented and often on demand (The evolution of marketplaces). There are numerous companies that are emerging to support marketplaces (Infrastructure for Marketplaces). This is allowing ever more markets to meet the basic requirements for supporting marketplaces (Thoughts on building successful vertical marketplaces). At the same time, millennials have a fundamentally different relationship to work. There is a real trend of them wanting the flexibility to work whenever they want for as much or as little as they want to support their needs and desires. This is creating a ready labor force for on demand companies. As a result industries that once required billions of dollars to tackle like the grocery business which led to the very public and epic failure of Webvan are being re-invented by asset light marketplaces like Instacart. Marketplaces are now reinventing wholesale offline industries from taxis (Uber), hotels (Airbnb), used cars (Beepi), but even home renovations (Sweeten) or beauty (Glamsquad) which until recently seemed impervious to online disruption. This is a trend that is only at its infancy and I have to admit we are very privileged to be marketplace experts when the world is moving in this direction. The venture world has profoundly changed over the last few years and our strategy has evolved accordingly. It’s worth pointing out, that it’s one of the real benefits of being angels to have the flexibility to evolve our strategy as the markets change. We are not bound by fund size or promises to LPs in terms of what we can or cannot do and what industries or geographies to focus on. I am sure our strategy will continue to evolve, perhaps dramatically, in the coming years especially when the markets eventually turn. In the meantime, I am sure we will meet amazing entrepreneurs and invest in awesome companies!